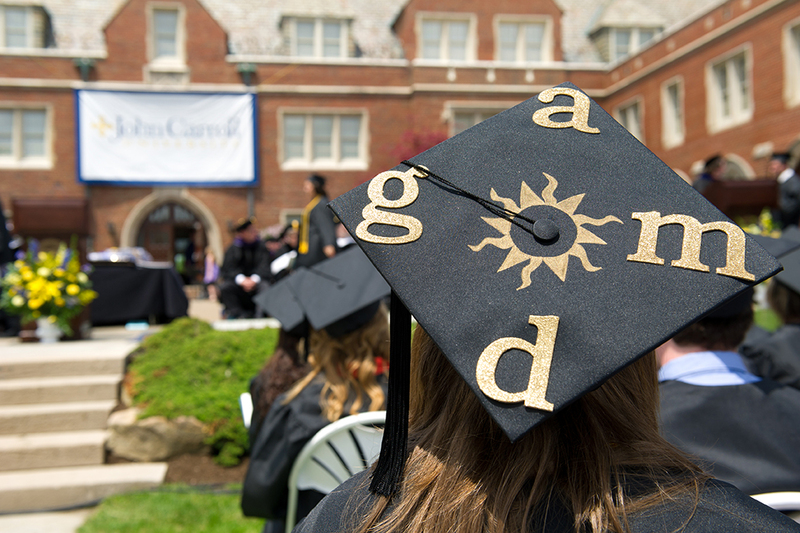 John Carroll University will graduate individuals of intellect and character who lead and serve by engaging the world around them and around the globe. As a Jesuit Catholic university, John Carroll inspires individuals to excel in learning, leadership, and service in the region and in the world. An environment of inquiry which embraces Jesuit Catholic education as a search for truth where faith and reason complement each other in learning. In pursuit of our educational mission, the University welcomes the perspectives and participation in our mission of faculty, staff, students, and alumni, of all faiths and of no faith. A rigorous approach to scholarship that instills in our graduates the knowledge, eloquence, sensitivity, and commitment to embrace and to live humane values. A campus committed to the intellectual, spiritual, emotional, and physical development of each student. An inclusive community where differing points of view and experience are valued as opportunities for mutual learning. A culture of service and excellence that permeates every program and office. A commitment to sharing our gifts in service to each other and the community. A campus that responds to demographic, economic, and social challenges. An appreciation that our personal and collective choices can build a more just world. Create a diverse community of faculty, staff, alumni, and friends dedicated to advancing the University’s vision, mission, and core values. Create a learning community of outstanding teacher-scholars characterized by the commitment to student achievement. Create a talented cohort of service-oriented staff committed to achieving and being recognized as a center of learning and service. Recruit, enroll, retain, and graduate a talented, diverse student body prepared for today’s global reality and committed to learning, leadership, and service that will engage the world. Secure resources necessary to foster an extraordinary learning experience and promote John Carroll’s mission as a Jesuit Catholic university. Assist in responding to demographic, economic, and social challenges in our region in order to support investment and employment opportunities and build confidence in our shared future.